Our music program strives to deepen and enrich each congregant’s quest for truth and beauty. Music is the perfect complement to the words in a service. Melodies, rhythms and harmonies speak directly to our emotions and provide us with understandings that are impossible to grasp through words alone. Jie Yi joined UUFH as Music Director in August 2018. 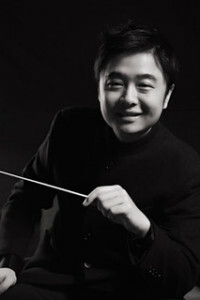 Jie holds a Masters degree in conducting from Manhattan School of Music, where he is a candidate for the Doctor of Musical Arts degree in conducting. In 2018, Jie conducted choral works at both Riverside Church and The Cathedral Church of Saint John the Divine. In 2017, he conducted excerpts from St. John Passion at the Oregon Bach Festival. He made his Carnegie Hall debut in 2015, conducting Yellow River Cantata. He was Chorus Master and Assistant Conductor at the Shanghai Opera House from 2008 to 2013. Jie was a recipient of the Asian Culture Council Fellowship in 2011 and also won the US-China Cultural Institute Fellowship for Young Conductors in 2006. You can contact Jie at music@uufh.org. Music has always played an important part in services at the UUFH. The Fellowship is fortunate to have many talented performers who give their time and energy to the congregation and it supports them in many ways. The choir, under the direction of Jie Yi is the nucleus of the music program, but we have instrumentalists and vocalists who perform in small groups or individually, in a variety of musical genres, to enrich the services. Care is taken to choosing music that deepens our understanding, complementing the theme of the service. The choir sings at several services each month from September through June, and rehearses every Thursday night from 7:30 to 9:30 in the Main Hall. They sing a wide range of literature, from the Renaissance to ethnic music, from Mozart to “hot off the press” compositions by director Jie Yi and members of the choir. In addition, the Choir presents their annual Music Sunday in the spring, in a service that highlights them with a special theme, such as spirituals, chant, or world music. 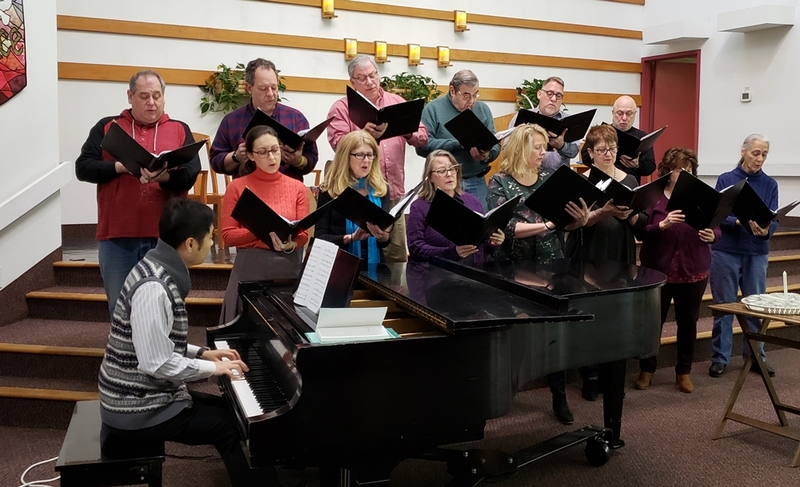 The Choir also participates in community interfaith events such as the annual Interfaith Thanksgiving service and the Martin Luther King Celebration in January. 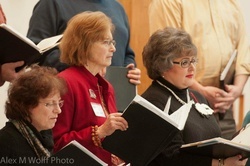 Singing in the Fellowship Choir is a most rewarding and enjoyable way to take part in the Fellowship community. New members are always welcome – sight-reading expertise, while valuable, is not required. Jie is a creative and talented music director, and the rehearsals and services are full of energy, good humor and fun! We, the members of the choir, coming from varied musical backgrounds, prepare and sing music as an integral part of the Sunday service. We know that experiencing beautiful music can be both passionate and intensely spiritual, for the listener as well as the singer. And so by our singing we will endeavor to touch each congregant’s spirit, inspiring him or her to relate wholeheartedly to the meaning of the service. As choir members we will relish both the consonance and dissonance written into our musical selections. As choir members we will learn to listen to ourselves and to each other and to work together to achieve greater harmony. We will sing for the broader neighborhood of Huntington, as at other venues or a public concert, so as to enhance the spirit of community amongst the people of Huntington. Our sources of authority are the Seven Principles which undergird our faith, and the religious pluralism which enriches it. We commit ourselves to the joy of singing, to the passion of our spiritual message to the congregation and to the enrichment of our communities. Performers of all ages are part of the Fellowship’s musical life. From time to time, the Intergenerational Orchestra and the Intergenerational Choir are featured in services. 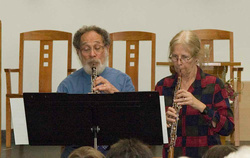 Individual musicians of all ages contribute to the regular services as well. Our Talent Shows are another intergenerational activity for the whole congregation. Since May 2006, we have celebrated our UU Heritage Day at the Fellowship, and many of our musicians take part in recreating our UU history through song and dance at this new annual tradition.